The decadently delicious flavor of chocolate cheesecake take a casual turn when baked in a pan and cut into squares. Garnish with your choice of fresh berries, toasted nuts, or chocolate curls, or top the squares with broken pretzel pieces and a drizzle of balsamic glaze. Variation: Use a 7 or 8-inch springform pan to make a traditional-looking cheesecake. This recipe is from Quick-Fix Vegan by Robin Robertson © 2011. Used with permission. 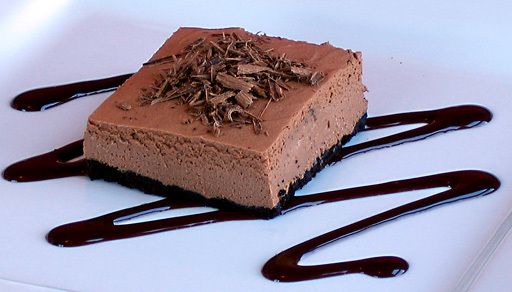 Let us know what you think of this easy vegan recipe: Chocolate Cheesecake Squares!